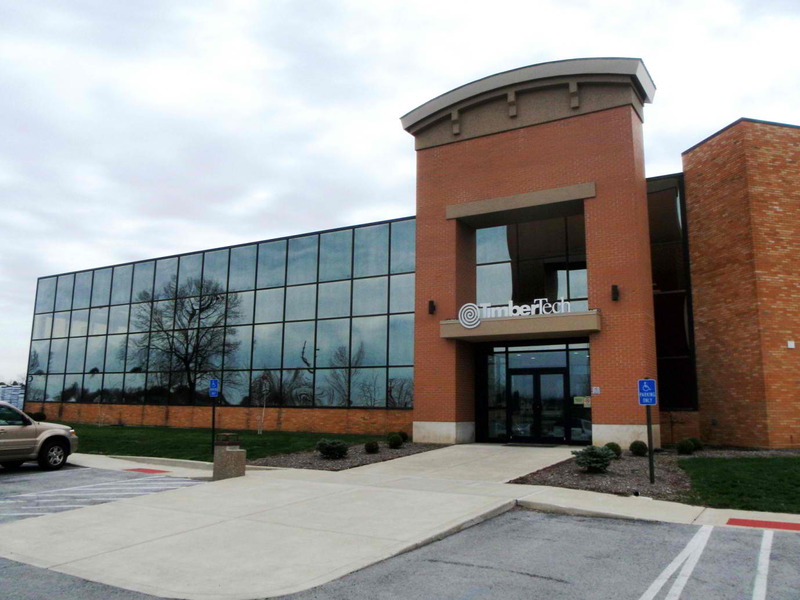 Archadeck of Columbus recently took a world-class tour of the TimberTech plant in Ohio. The experience left us in awe of the whole process and stringent standards TimberTech uses to create magical materials for your perfect outdoor oasis. Do you remember how excited Charlie from “Charlie and the Chocolate Factory” was when he got inside the chocolate factory and got see where and how Willy Wonka made all that scrumptious candy? Well, that is a little how I and members of the Archadeck of team, Dennis Schaeffer and Rob Mitchell felt when we recently had the opportunity to take a plant tour of the TimberTech plant in Wilmington OH (Columbus) this past week. We were invited to participate in the TimberTech plant tour along with other contractors and dealers from all over Ohio. The event was called “Dare to Compare”. On our walk-through we were able to see the product being made on extruders. We were also given the opportunity to review the company’s marketing and social media and what they do to help their contractors. We spent time reviewing a number of new products and discussing the benefits these new products will have for our customers. The plant here in the Columbus area makes all synthetic decking and rails. We were also able to visit the main plant in Wilmington, OH where they make the remainder of TimberTech products. In essence we got a dual tour of the TimberTech facilities during this visit.This particular facility has the capacity to send out 50 semi-trucks of their product daily, and their warehouse stores 500 semi-trucks full of product at a time. The massive size was awe inspiring. 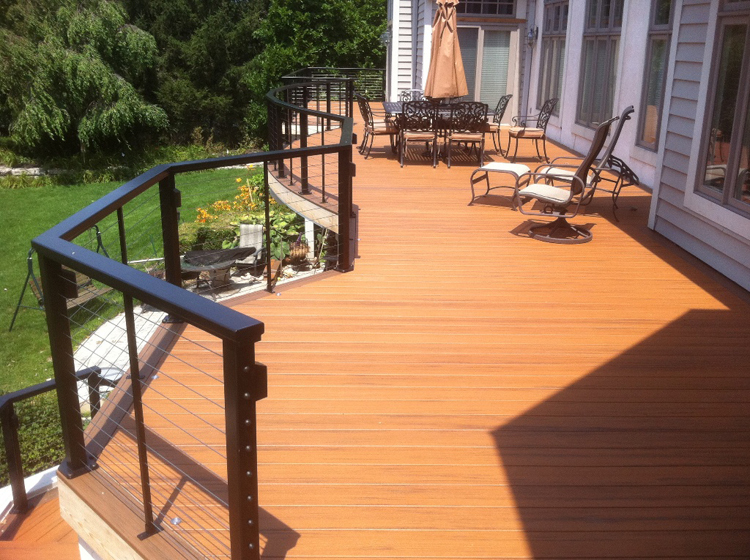 Archadeck of Columbus built this stunning TimberTech deck in Dublin, OH. The Muirfield golf course serves as the backdrop. I was fortunate enough to take a tour in 2006 when Archadeck of Columbus and TimberTech initially established a relationship. The main point that sticks out in my mind from then until now is their expansion into other products. When I visited in 2006 it involved just wood and plastic composite. The trend we are seeing now is the growth of the PVC products and also the growth of polypropylene and polyethylene products as well. Watching the magic happen in real-time is really amazing. The extrusion of the material appears similar to “Play-doh” in composition, this material is put through a mold which gets pressed and becomes a shape. When mixing the wood pulp with the plastic there are numerous tests the product goes through, such as those similar to a stress test. TimberTech uses Maple in their wood pulp because it doesn’t absorb a lot of mold and mildew spores. They get the maple through recycling practices by using recycled wood cabinetry and furniture. They even re-use the waste off their own decking boards after they emboss a decking board and as it grinds out the top of the board, the remainder is then re-used. They also conducted competitive comparisons on their product such as UV tests, humidity tests, mold and mildew tests, and scratch tests. TimberTech conducts these tests on their product and those of the competition, so we got to see a great deal of different manufactured products tested during the tour. A finished decking board takes an astounding 48 hours to cool completely after it’s production. Our team walked away impressed with the entire process. Our biggest impressions were the extent of the efforts taken to ensure the product uses Green technology and how much TimberTech is actively involved with that. They have reduced their total waste by 95%, on what they used to send to the dump. TimberTech’s care and quality checks are also very impressive. As we watched the quality tests throughout the day, no stone is left unturned, from testing every hour for quality and the product’s tolerance level. We would like to sincerely thank TimberTech for giving us this wonderful opportunity to experience this up close and personal. This only solidifies how proud we are to have them as a partner and how strong their presence is in the market. Get your own personal tour of beautiful TimberTech decks by visiting our composite and PVC deck photo gallery located on our website.